Players dribble their ball from one side of the field to the other. ** Diamond in the middle, cones are NOT in front of them. * Once White players dribble though their Channel, that triggers Blue Lines to start. - VISUAL CUES: As soon as one team is done, the next goes. Lets get them into good habits with out the coach using command to give them signal to "go"
- DEFENDING TEAM TO HAVE 2-1 formation only during goal kick for opponent. This will help players receive with less pressure. 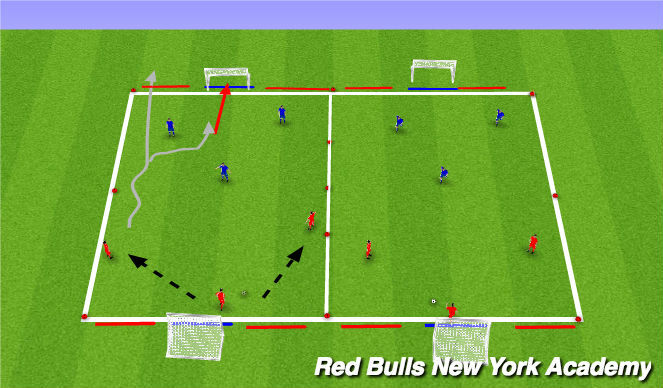 - Dribbling topic, but use pass to restart. - Ronaldo or Messi Touches ?